15 minute Ricotta Donuts - Let the Baking Begin! Ricotta donuts come together in less than 15 minutes and you can toss them with powdered sugar, put them in a Ziploc bag and take’em straight to your picnic or wherever you go to enjoy the sunshine. They’re soft, slightly moist (from the ricotta) and kids absolutely love these bites of heaven! No waiting for hours for the yeast to rise, enjoy them within minutes! After what seems to be years of rain Portland has finally been blessed with some warm weather and sunshine. On days like these you really don’t want to be stuck at home cooking up a storm. Salads and cold sandwiches will do for weather like this. This doesn’t mean that you’re to be stuck with no desert, oh no! I was stingy about my oil (I don’t reuse it after frying), so I used a really small pan that may be used up 1.5 cups of oil, which took me a little longer to fry my donuts, but if you use a normal size cast iron pot or heavy bottomed sauce pan, you’ll be done in a jiffy. Also, this recipe can use ricotta or fresh farmers cheese , as long as it’s well drained and not runny. If it’s not, not a problem, just put the cheese in a strainer and allow for extra moisture to drip off (or press firmly with paper towel to absorb the extra moisture). Since cheese has different moisture content you will need to add or not 1 additional egg. I started out with my recipe and then as I mixing it, the mixture wasn’t coming together because it was too dry, so I ended up needing to add 1 more egg to bring it together. As far as the chocolate sauce, it’s an optional serving suggestion but definitely not a necessity, powdered sugar is all these babies need! But hey, when did chocolate ever ruin anything? So, I’ll let you decide. Place all ingredients (ricotta, flour, eggs, egg yolks, sugar, baking powder, sugar & salt) into a bowl and either with your hands or with paddle attachment of your mixer, mix together until it comes together. If your mixture looks too dry, beat 1 egg and add enough of the egg to bring it together. Pinch off a piece of dough and roll into a walnut size ball. Alternatively you can roll the dough to 1 inch thickness on a well floured surface and cut out 2 inch circles. Heat around 2-3 inches of oil over medium heat in a heavy bottomed pan or cast iron pot until 350F. Drop several balls into the hot oil and allow to golden up on one side before turning for the other side to fry. Do not overcrowd as the donuts expand when they fry. Once golden on both sides, remove donuts with a slotted spoon to a paper towel lined plate. 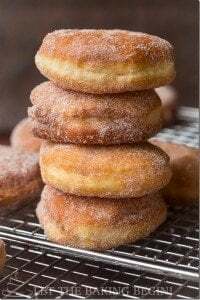 Allow to cool just slightly and dust with powdered sugar rolling the donuts to allow them to be coated completely. Serve as is with powdered sugar, or serve with Chocolate Ganache on the side (click for full recipe & instructions on how to make it) . Enjoy with tea, coffee or your drink of choice! 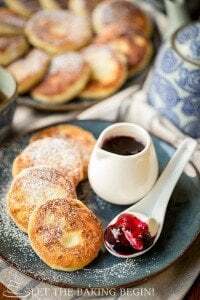 Quick Ricotta Doughnuts – Quick easy dessert that’s a crowd pleaser, every single time! 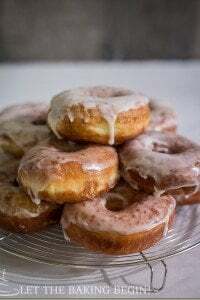 Super Soft Doughnuts with Sugar Glaze – The best homemade doughnuts. Simple Sugar Coated Doughnuts – Soft doughnuts coated in sugar. Heat around 2-3 inches of oil over medium heat in a heavy bottomed pan or cast iron pot until 350F. Drop several balls into the hot oil and allow to golden up on one side before turning for the other side to fry. Do not overcrowd as the donuts expand when they fry. Once golden on both sides, remove donuts with a slotted spoon to a paper towel lined plate. Allow to cool just slightly and dust with powdered sugar rolling the donuts to allow them to be coated completely. Serve as is with powdered sugar, or serve with Chocolate Ganache on the side (click for full recipe & instructions on how to make it) . Enjoy with tea, coffee or your drink of choice! ARECIPE!! 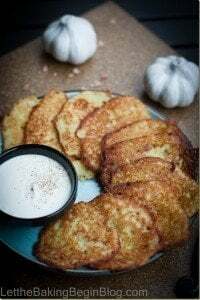 I just made these and they were absolutely fabulous!! 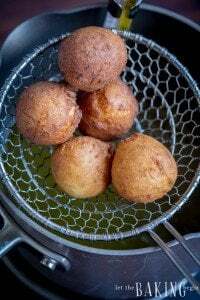 They were as easy to make as hush puppies, yet so divinely inspired! We tried caramel and chocolate fudge dipping sauces, but my favorite by far was when they were coated entirely with powdered sugar while still hot! Tasted like fresh beignets from Cafe DuMonde in New Orleans’ French Quarter! They were out of this world! Will use this exact recipe & directions over and over, Lord willing! These are GOOD! I pinned this a while back and just got around to making them because I had ricotta that was about to expire. So glad I finally made these babies…YUM! Anyone looking at this recipe should make it without hesitation. Thanks for using my recipe! Quick question: what if I accidentally made the batter too wet? How would I fix that? While it’s possible to do them in the oven, they would not taste like the fried version. It’s the fried outside that makes doughnuts taste like doughnuts. Baking them in the oven would make them into liittle buns instead of doughnuts. Does mean that all 4 egg yolks could be replaced with 1 whole egg or that one of the egg yolks could be replaced with 1 whole egg? Seems like replacing all 4 yolks for 1 egg would make a considerable difference in texture. What do you suggest? Thanks!! Hi, thank you for your question. Yes, you can replace one whole egg with four egg yolks. There will be a difference in texture but if you do not want to ruin four eggs you could replace it with one egg.